Last week was Spring Break in our area. I’m usually a fan of breaks in the schedule but that’s only when they’re preceded by a long period of sustained effort. Unfortunately, the period between Christmas and now has been disjointed and inconsistent. This week we start our Technical Training Curriculum. I’ve talked about this in previous episodes so you can look back if you’d like to hear more about it. Hopefully we’ll be able to have a regular schedule of practices and games between now and the end of the spring. The weather can be unpredictable here in the spring so we’ll just keep our fingers crossed. Today’s question comes from Sammy a long time listener and contributor. He’s asking about post workout nutrition. “I know you’re a runner. I’m a novice at best, but I’m trying to begin to take my personal fitness a little more seriously. I’ve been listening to a lot of running podcasts. I heard recently that the best recovery nutrition needs to start within 30 minutes of the activity and should be close to a 4 part carb/ 1 part protein ratio and that chocolate milk is that exact ratio, making it the perfect recovery drink after a run. I know a coach locally that always urges players to drink chocolate milk after a game, especially in tournaments when they’ve played one game and there is another one in an hour or so. Thanks for the question Sammy! That is a really interesting topic to me. I could go on about this one for hours but I’ll give you the short version. The timing of nutrition after exercise matters more if you’re going to be exercising again within 12 hours. So it would be important in a tournament environment. For a daily run/workout getting food onboard an hour or two post-exercise isn’t going to make a difference one way or the other. it’s true that chocolate milk has the optimal balance of carbs and protein but so does a turkey sandwich and the sandwich is better for you. The milk marketing machine is very good at making milk seem like the perfect food but what other animal drinks milk after infancy? More than that, which animal drinks the milk of another animal? The human body doesn’t process dairy well. If you don’t think milk affects you negatively, remove it from you diet for a month and then have a glass of milk or bowl of ice cream and see how you feel. I talk about my role as a coach a lot on this podcast. 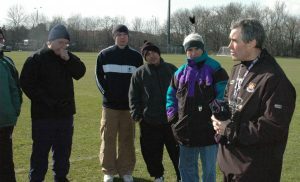 I’ve also shared some of my experiences as a director of a recreational league. Today I want to discuss my other role in our club, that of an Age Group Director. I’ll talk about why I think the role is important and what goes into a year as an Age Group Director. Next week I’ll let you know how the first full week of training for the spring season went.